More than just memories of Wrigley! The advent of baseball season recently had me recalling the days of my youth. I remember Mr. Cub, Ernie Banks, coming to bat for one of the last times during his final season. I was there with a bunch of kids from the church youth group. Banks was pinch-hitting that summer’s day in 1971 and received a standing ovation when his name was announced. My favorite memory of Wrigley Field would have to be the way Banks delivered a special tribute to the Cubs faithful with a pinch-hit home run, one of three dingers he hit during his last of 21 years with the Cubs. Wrigley Field – THE best place in Chicago to get a suntan – is a place made of and for memories, and you can own a piece. Memories have built the ballpark then – new owner Bill Weeghman moved the Cubs to in 1916. Wrigley Field was the place where Babe Ruth allegedly called his home run to center field during the 1932 World Series. Wrigley Field was witness to Sammy Sosa’s challenge to Mark McGwire’s assault on Roger Maris’ single-season home run record last year. Sixty-eight years before that, Hack Wilson called Wrigley home in 1930 when he terrorized National League pitchers for 56 home runs, 146 runs scored and 190 runs batted in. Seven years later, Hall of Fame catcher Gabby Harnett belted his way into baseball legend and lore with his two-out, bottom of the ninth “homer in the gloamin” as darkness descended on an unlit Wrigley Field on Sept. 28, 1937, to lift Chicago into first place on its way to a pennant. The great Rogers Hornsby cleaned up ground balls in the infield, outfielder Kiki Cuyler patrolled the outfield, Hippo Vaughn and Fergie Jenkins fired fastballs from the mound and managers Joe McCarthy and Leo Durocher nervously paced Wrigley’s dugout. Whether shivering through opening days, baking in the summer sun or watching the ivy walls turn brown in the fall; Wrigley’s field of dreams has a memory for every Cubs fan. Photographer Frank Schiefelbein, has captured a vision of Wrigley Field like no other. He’s offering a special purchase on a print of his vision to Cubs fans around the world. 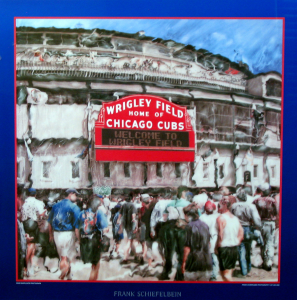 Whatever your most special memory of Wrigley Field, this poster is sure to inspire ones old and new.